With Valentine’s Day coming up, I know how important it is to add a little TLC into all my relationships. My relationship with my car is definitely something I want to keep running smoothly. What are some things I can do to show my car the love it deserves? Maintain Your Relationship: A little bit along the way can save time, hassle and money! Oil changes, fluid flushes, tire rotations and more are all part of maintaining your car. 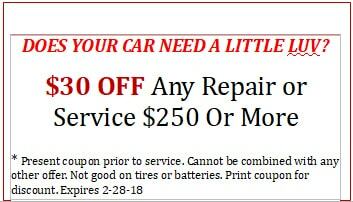 Not only do they help prevent costly repairs, but they also are vital to maintaining your warranty and car’s longevity. Find your car’s manufacturer maintenance schedule usually located in your glove box for a guide to when these important services should be performed. Remember your driving style and Arizona’s climate can alter these a bit, so be sure to have your car checked out regularly. Give it Some Sparkle: Nothing shows the LUV like some shine. Keeping your car clean not only keeps you riding in style but also helps secure your investment. The better the condition of your vehicle, the higher the resale or trade-in value. The environment including rain, dirt, debris, bugs and sun damage are just some of the things that can damage your car. Regular car care can ease the wear and tear of these frequent hazards. Plus, who doesn’t like a clean car? Clear the Air: Take some deep breaths knowing your car is taking care of you. Did you know you have a cabin air filter that allows your car to filter the outside air before you breathe it in? Your car actually helps you breathe easier by trapping allergens, dirt and other particles. Help your cabin air filter perform properly by changing it regularly. Most cabin air filters should be replaced every other oil change. When is the last time you have cleared the air with your car? Go a Little Easy: Lighten your foot on the gas pedal, go easy on the brakes, avoid driving distractions, and take some time to enjoy the safety and freedom your car can provide. These behaviors slow wear and tear on your car. Your car will love you for it and you will be driving happier! Listen: Just like any good relationship, a little listening goes a long way. Pay close attention to the sounds your car makes. Unusual sounds are often indicative of problems with one of your car’s 10,000 parts. YES, 10,000! If you hear anything out of the ordinary, make an appointment with Honest-1 for a comprehensive vehicle inspection soon before the yelling begins. Any good relationship involves some TLC, including the one you have with your car. Take the time to give your car what it needs and it will continue to take care of you for a long time. Just like with anyone you care about, it is the little things that make a big difference! Use this coupon for SWEET Savings!